Since 2008 our team has been processing and analyzing fauna from the Hoogland locality (Adams et al., 2010), and as of 2014 the tally of Hoogland specimens catalogued and reposited at the Ditsong National Museum consists of 11,042 specimens. Descriptions of these new Hoogland specimens (including the first in situ specimens from the site) are currently being refined and integrated with expanded palaeomagnetic and U-Pb sampling of the deposits into a synthetic publication for 2015. Adams JW, Herries AIR, Hemingway J, Kegley ADT, Kgasi L, Potze S, Hopley P, Reade H, and Thackeray JF. 2010. 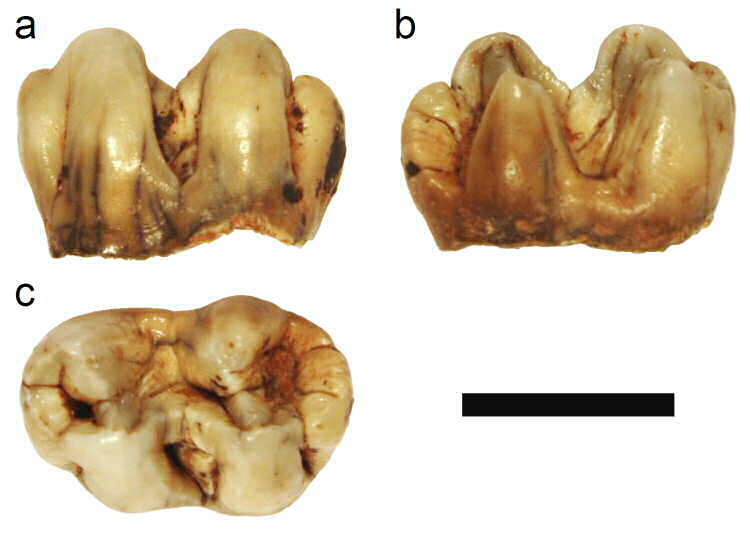 Initial fossil discoveries from Hoogland, a new primate-bearing karstic system in Gauteng Province, South Africa. Journal of Human Evolution 59: 685-691. The HLP 1600 gelada (Theropithecus sp.) left mandibular first molar from Hoogland.